What is your go-to easy quick dinner? Ours is a salad and soup (canned) but I’m always looking for better and more healthy ideas. 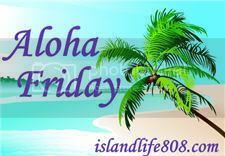 This entry was posted in Aloha Friday, Fun and tagged Aloha Friday, Fun. Grilled cheese sandwich or Frozen to Microwave eggroll. Spaghetti! Can’t beat the jarred stuff in a pinch! We like to just throw a piece of fish in the oven with some seasoning. Tuna Melts done in the Panini Press with a salad on the side. Actually, anything done on the Panini maker. Of course, whatever we make on the Panini maker HAS TO have ooey-gooey cheese melted all over it. So fast, so easy, so yummy. I’ve also got an insanely easy and fast chicken parmesan recipe that I serve with pasta and Caesar salad…or the baked salmon recipe I posted on my blog last week. Most of my dishes are easy and take less than 30 mins to make. I always have reduced fat ground sausage cooked up in the freezer & use it in making breakfast pizza. It’s super easy to make (about 7 min) & baking is only 23 min. I serve it w/ a green salad & some fresh fruit. Email me if you’d like the recipe. We often will make tomato soup with barley and either carrots or cauliflower. Veggie burgers are also a quick fix. Left overs lol. I would say tacos or soup.